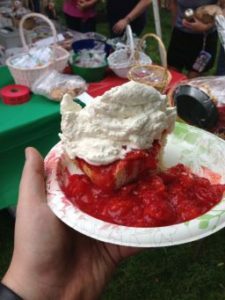 On Saturday, June 16th, the 43rd annual Strawberries ‘N Arts Festival will take place on the Westford Town Common. Sponsored by First Parish Church United, Westford, this traditional event offers the whole family a fun day that includes high quality artwork and crafts for purchase, a wide variety of food and homemade strawberry shortcake, plus musical performances by several local groups. Admission is free and everyone in Westford and beyond is welcome to join in the festivities. The highlight of the day for many is the serving of fresh strawberry shortcake by FPCU members. Over 350 quarts of fresh strawberries, more 1200 oversized shortcake biscuits and lots of real whipped cream are combined to create over 1000 servings of this delicious treat. Customers can begin to line up before 12:30 p.m. to partake in what for many has become an annual ritual of the beginning of the summer season. Also available are a variety of grilled food including hamburgers, hotdogs, and Westford’s favorite Hubba’s BBQ pulled pork sandwiches. This year, the Strawberries ‘N Arts Festival has over 90 craftspeople in attendance, lining the triangular green in Westford’s historic town center. Crafts for sale this year include handcrafted woodworks, a variety of handmade jewelry, wrought iron, handpainted glassware, framed photographs and portraits & much more. Additionally there will be crafts and entertainment for the kids, and continuous music performed by several local groups throughout the common and on the Westford Common bandstand. Rain date (in extreme weather conditions only) is Sunday, June 17th. Free parking is available at the First Parish Church United, the J.V. Fletcher Library, Roudenbush Community Center and Abbot School. Proceeds will go to the First Parish Church United, which supports a variety of local and international charity organizations through its outreach programs. For more information, please visit www.TheStrawberryFestival.org.